Affordable, easy to find and coming from a company with decades of experience, Jarrow Formulas Sleep Optimizer is a near ideal dietary supplement choice for the sleep-deprived. However, it must be noted that there is no money back guarantee. 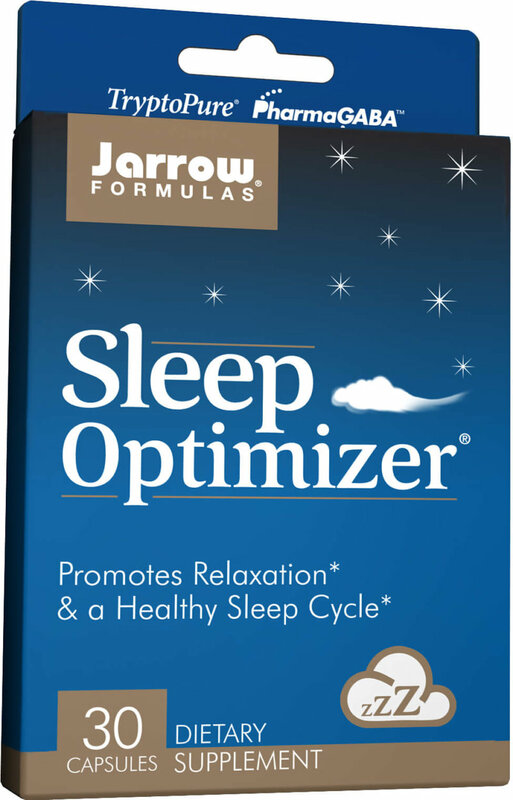 Visit Jarrow Formulas Sleep Optimizer Now! Los Angeles-based Jarrow Formulas is no stranger to the nutritional supplement industry. Founded in the 1970s and incorporated in the 1980s, today the company markets its formulations in several countries around the world; including Canada, Mexico, and the US. It’s not just a supplier, either; the company funds research studies, and its professional staff does take part in scientific pursuits and collaborations with academic environments that result in better formulations of Jarrow Formulas products. It is the company’s mission to provide superior nutrition to its customers; through proper, high quality and cutting edge formulations that are also affordable. Jarrow Formulas’ product line boasts of amino acids, enzymes, herbal concentrates, minerals, probiotics, vitamins, and more. The company has 24 different products that can be classified under sleep aids, stress relievers and mood enhancers; two of which—because it’s sold in both 30 and 60 capsule increments—are the subject of this review. Apart from the proprietary blend that the company calls the Sleep Optimizer, other Jarrow Formulas sleep aids include Mellow Tonin, a Melatonin and multivitamin formulation; and single-ingredient supplements like L-Tryptophan, Melatonin, and 5-HTP. While Jarrow Formulas Sleep Optimizer is suitable for those having trouble falling asleep and maintaining a consistent and regular sleep cycle, it’s not for everyone. This dietary supplement is definitely not for children under the age of 18; or for those that are trying to conceive, pregnant or lactating. As always, it is important to consult your physician before adding this product to your daily routine, particularly if you have a medical condition—this includes asthma, diabetes, epilepsy, and more—or are already taking maintenance medications that may interact with Jarrow Formulas Sleep Optimizer. Like every dietary supplement in the market, it’s worth noting that this product—legally speaking—is not intended to cure, prevent or treat any disease. As promised by its name, Jarrow Formulas Sleep Optimizer is an optimized formulation that combines amino acids and herbs to give you better sleep quality. It is sold in vegetarian gel capsule form. L-Tryptophan, Lemon Balm Leaf Complex and PharmaGABA all work together to help promote relaxation and provide stress relief. Like Lemon Balm, Valerian Root and Hops are well-known as all-natural sleep remedies; as such, Valerian Root Complex and Hops Strobile Complex in this formulation work in tandem to help reduce sleep latency. Finally, there is the central ingredient: Melatonin. Also all-natural, it is a hormone secreted by the human pineal gland, which functions as a control for the biological clock and sleep cycle. Below is a list of ingredients and their amounts, taken from the 30-capsule product offering. Simple and straightforward as it is, Jarrow Formulas Sleep Optimizer does also contain the following: gelatin, magnesium stearate, maltodextrin, and silicon dioxide. However, there’s good news for the allergy-prone: There’s no dairy, no egg, no fish or shellfish, no gluten, no peanuts and tree nuts, no soybeans and no wheat ingredients. The instructions are simple: ingest two capsules about half an hour before bedtime, or as directed by a healthcare professional you trust. Do not take the capsules if you still need to operate any kind of machinery afterwards—this includes everything from working a stove to driving a car—because its purpose is to make you feel sleepy! Better to be safe and just go straight to bed. 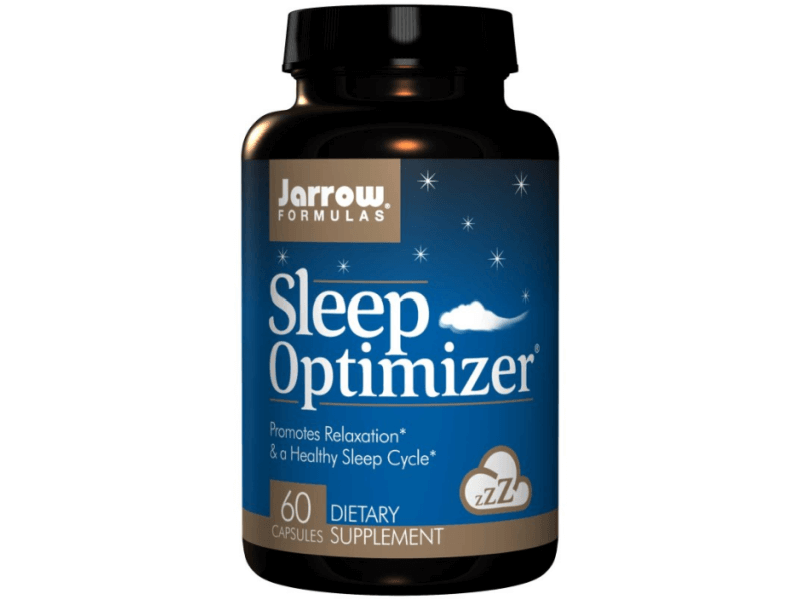 Jarrow Formulas Sleep Optimizer is sold in two different packages—a pack of 30 capsules and a bottle of 60 capsules—so you can choose to use it daily for either two weeks or an entire month. Because it is an over-the-counter alternative to prescription sleeping pills, it can be easy to forget that Jarrow Formulas—like most sleep aids, all-natural or not—is not intended to be a permanent part of your daily routine. Rather, it is supposed to be a two-week or one-month bedtime habit that helps to realign a biological clock confused or thrown off by changing work shifts, crossing time zones or a particularly stressful event. Different people react to these formulations in different ways—and because these products are regulated by the government, we can be sure that any formulation that’s been on the market for a while has not been found toxic or harmful when used correctly. However, when it comes to side effects, the best way to look into it is to research the ingredients one by one. Truthfully, this will probably be what your doctor will do, as well; when you talk to them about this product—or any dietary supplement, for that matter. For instance: Hops and Valerian Root are strong sleep remedies, and both may interact with anesthesia and other medications needed before and after surgeries. If you are scheduled for one, it may be a good idea to stop taking Jarrow Formulas Sleep Optimizer two weeks before going under the knife. Additionally, Hops has been known to worsen depression; and some chemicals present in Hops are not good for people with hormone-sensitive medical conditions like breast cancer or endometriosis. Valerian, on the other hand, has been known to cause excessive drowsiness the morning after its use. The bottom line is that natural does not always equal good, particularly in proprietary blends and formulations that haven’t been tried and tested by studies and years of consumer experience. Even Melatonin—something your own body produces—should not be automatically thought of as safe for use at all times. Fortunately, Jarrow Formulas has been around for decades; a quick online search will yield all the customer reviews and comments in relation to the Sleep Optimizer and the company’s other products. Although the official Jarrow Formulas website does not have its own online store, it does have a very user-friendly store locator that shows you where you can purchase Jarrow Formulas products by US State. If you prefer to shop online, you can do that, too; there’s also a list of online supplement specialty retailers, like Vitamin Lady. You can also order Jarrow Formulas Sleep Optimizer from Amazon; however, Amazon states that it cannot ship the product internationally. 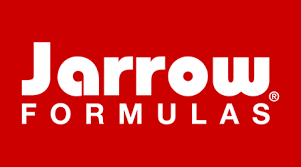 Jarrow Formulas promises its customers what it calls “total quality”, which it applies to every aspect of the business: conforming to regulations, ensuring quality control, conducting formulation testing, and even sourcing and marketing its products and their ingredients. Every Jarrow Formulas product is manufactured in facilities certified as upholding current Good Manufacturing Practices (cGMP). Part of following cGMP regulations is making sure that everything used in the products made is evaluated so that the composition, identity, purity and strength of the materials meets standard specifications; which is why Jarrow Formulas does ongoing and constant qualifications and audits of its raw materials suppliers. On top of this, the majority of Jarrow Formulas products are made by sister company Jarrow industries, which features state-of-the-art and pharmaceutical grade equipment—not to mention medical grade levels of quality control. FDA recommended High Performance Thin Layer Chromatography (HPTLC) is used on every botanical material for verification, prior to its use in manufacturing. If dietary supplements worked with 100% accuracy, they likely wouldn’t just be sold as supplements; so let’s give effectiveness some leeway. However: Unlike some of its competitors, Jarrow Formulas does not have customer reviews prominently displayed on its official website; though that may have something to do with the fact that it does not have its own online store. Amazon customer reviews have mostly been positive; reporting good sleep quality but not always better sleep duration—though some report that it feels like they get better sleep with fewer hours needed. Some have even reported lucid dreaming, though whether that is positive or negative is up for speculation. Some negative reviews highlighted a feeling of drowsiness that was not easy to shake off in the morning; but other reported the opposite. A consistent complaint—even by those that found the supplement worked perfectly—is the smell. The capsules have a strong scent that some may find unpleasant, but it’s perfectly normal considering the ingredients; especially the herbs, and particularly the Lemon Balm and Hops. Moreover, many dietary supplements that use botanical ingredients and are formulated for sleep have strong odors; Jarrow Formulas Sleep Optimizer is not an outlier. Because Jarrow Formulas relies on retailers—physical and online—to sell its products, sales to direct consumers are beyond their scope. As such, they offer no return policy or guarantee. For shipping grievances, it is likely better to contact the store you bought Jarrow Formulas Sleep Optimizer from, rather than the company itself. However, if you have a question about the product—a packaging issue, health concern, manufacturing error, or something similar—Jarrow Formulas is relatively easy to contact! Although they do not offer live chat, its customer service department is open Monday through Friday from 7AM to 6PM PST. You can call, fax, email or leave a message using an online form; all contact information is available on Jarrow Formulas official website. Price points may differ based on where and how you purchase Jarrow Formulas Sleep Optimizer. For example, as of this writing: On Vitamin Lady, a bottle containing 60 capsules is priced at $18.65. On Amazon, the same product is priced at less than $10. With regular and recommended usage, the contents of the bottle are enough for 30 days. Again, and we cannot stress this enough: Please do consult a trusted healthcare professional—preferably one that is familiar with your medical history—before adding dietary supplements to your diet. Do ask your doctor questions about Jarrow Formulas Sleep Optimizer, and make sure you aren’t taking maintenance medication that may be contraindicated with it. Definitely do not take Jarrow Formulas Sleep Optimizer if you are under 18 or have a medical condition that may be affected by it. We don’t like that Jarrow Formulas does not offer a money back guarantee, but that it likely due to the fact they they don’t do direct sales. After having noted all of the above, though, there is something to be said for a prescription-free, easy to find and affordable sleep aid that is vegetarian and manufactured by a company with a long history of excellence and accountability. If your doctor tells you that you can try it, by all means, do just that. It may just help you sleep better.